Most people think they listen well, but they rarely do – not at this level. Listening this way is a radical act. Nancy Kline has identified 10 behaviours that form a system called a Thinking Environment, a model of human interaction that dramatically improves the way people think, and thus the way they work and live. Listening – the quality of people’s attention for each other – is the core of this method. 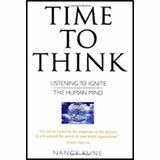 In Time to Think Nancy Kline asserts that as change proliferates in our lives and our organisations, we must prize each other’s minds above all else. We must learn how to help people think for themselves. In this book, she describes how we can achieve this and presents a step-by-step guide that can be used in any situation. Whether you want to have more productive meetings, solve business problems, create bold strategies or build stronger relationships, this book offers you a new world of possibilities.